100-400 AS 1:2 Macro Lens! Digital capture: EOS 1Ds, 1.4X II TC, 500mm f/4 L IS lens. 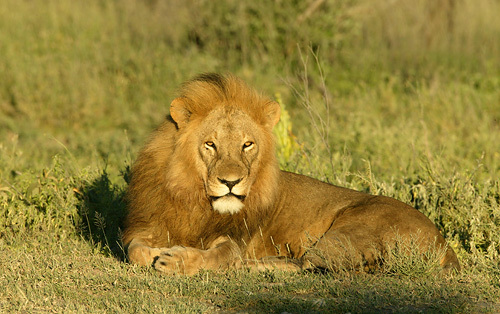 The lions of Ndutu are clean and caramel-colored! It ain't just birds! 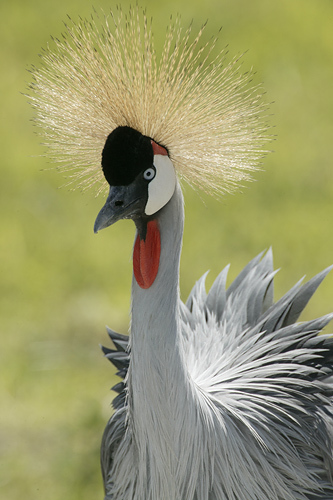 On Saturday and Sunday, March 22-23, 2003, internationally renowned bird photographer Arthur Morris will present a two day Seminar--The Art of Nature Photography: It Ain’t Just Birds. More than 10,000 of Mr. Morris' technically perfect, artistically designed images have appeared in virtually all natural history, photography, and birding publications, as well as in many general interest publications, prestigious calendars, advertisements, and on posters and web sites. Artie has been a Canon contract photographer since 1995, has done a worldwide television commercial for the EOS 1N, and has appeared in seven episodes of the Canon Photo Safari television program. He is a contributing photographer with VIREO (Philadelphia), Windrush Photos (UK), and The Stock Market, (New York). He has written four books; the latest, The Art of Bird Photography is considered the classic how-to work on bird photography. He is a columnist for Outdoor Photographer. This seminar is for all nature photographers (not just bird photographers) who want to learn how to make better images. Artie will describe the methods and techniques that he has developed and used since 1983. His comments on equipment (including digital), film, autofocus, light, exposure, composition and picture design, image sharpness, getting close to wild subjects, and his tips on photographing action and behavior will benefit everyone with a telephoto lens who wishes to dramatically improve the quality of their images. 1. All about modern autofocus cameras and lenses as well as the pros and cons of both the Canon and Nikon systems and digital photography. 2. How to get closer to free, wild and unrestrained creatures than ever before while minimizing disturbance. 3. The secrets of producing razor sharp images and the benefits of image stabilizer lenses. 4. About Artie's two favorite films, and how and when he uses them. 5. How to shoot calendar quality silhouettes at almost any time of the day! 6. How and when to use flash and projected flash as main light and as fill light. 7. How the quality and the direction of natural light affects your images. 8. How to come up with pure, clean, out-of-focus backgrounds that are the hallmark of Artie's style. 9. How to use their camera’s evaluative metering system to come up with perfect exposures quickly and accurately. The cost of the Two-Day Seminar is $100.00 at the door, $90.00 in advance. If you buy your ticket on or before Feb 14, JPI is offering an early-bird discounted price of $80.00. You can sign up for the SAT/SUN only by calling JPI (941 752 0550) or by visiting the store on SR 70 E, about 1 mile West of I-75 at 6709 State Road 70 East, Bradenton FL 34203. Coming from the north use Exit 217, from the south use Exit 217B. The phone number is 941-752-0550. 2-To register for the one or both of the ITF-Workshops, send a check made out to “Arthur Morris” for $200/day to Arthur Morris/BIRDS AS ART PO Box 7245 Indian Lake Estates, FL 33855. Please be sure to include your preferred date(s), your home address and phone number, your work number, and most importantly, your correct e-mail address if you have one. Amazingly, we have received 3 deposit checks for this incredible trip, one additional check "is in the mail, " and Martin Feldman and his wife are strongly considering joining us... With Todd and I, that would make 8. We have reservations for 4 vans, with 3 photographers per van, so the likelihood is that our initial reservations will be accounted for fairly soon. We are not at all averse to traveling with more than 12 folks as the safari vans will not be convoying, that is, each van will set out on its own to maximize the photographic opportunities and avoid the traffic jam scene. 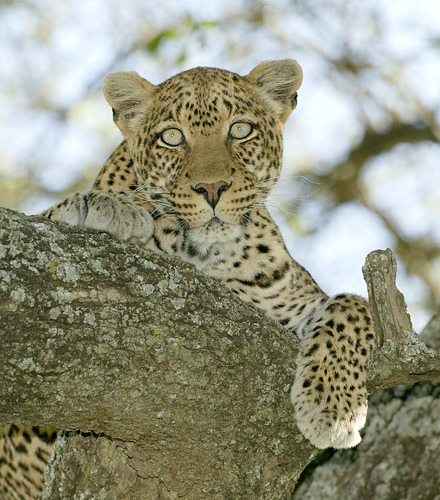 There are virtually unlimited subjects on both morning and afternoon game drives. And heck, the fact that I alone missed the spectacular Saddle-Billed Stork on several occasions is reason enough for me to return. In any case, if you are at all considering joining us please do get in touch via e-mail so that we may up-date our reservations. (Many of the lodges sell out nearly a year in advance...) See BAA Bulletin for additional details. Bulletin 98 should be archived soon--if you would like a copy before it is posted, please e-mail us and request same. 100-400 IS ZOOM LENS AS 1:2 MACRO LENS! 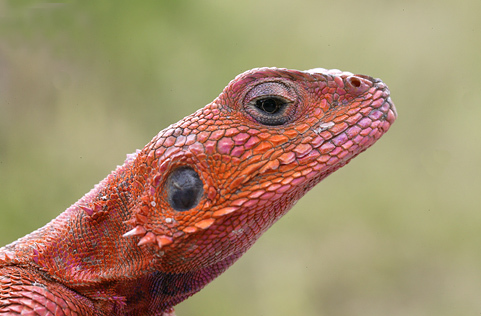 At one of the lodges in Tanzania, we encountered some ridiculously tame Agama lizards. I did not bring the 180 macro to Africa, but I wanted to do some close-ups of the lizard's heads. What to do? When I began, I had no clue as to the solution (if there was one). Using the two-element diopter would give me the magnification that I wanted but I simply could not get within an inch or two. I could however, get within four inches or so. I fudged around a bit and eventually came up with the following: Mount two 25mm extension tubes between the lens and the camera body. Rack the lens back to 100mm! Set the lens to minimum close focus. Place the front of the lens right on the rock and then approach the lizard carefully to within 4-5 inches until the head snaps into sharp focus! Press the shutter button. I am back to Orlando Airport on Sunday morning to fly to Albuquerque. I will be working with the NANPA scholarship students on Monday afternoon and Tuesday morning, and then photographing at Bosque on my own through Wednesday morning when I head back up to Albuquerque for the 2003 NANPA Summit. On Sunday afternoon and Monday morning I am co-leading a Bosque NANPA workshop and then conducting the Bosque Post-NANPA IPT (still only 4 registrants--late registrants welcome). I fly home on February 28. I will be home only 4 days before I head down to Fort Myers for the SW FLA IPT! Life is tough. In all seriousness, I regret that I will be unable to answer general queries until mid-March but will be glad to do so after then. If you will be at NANPA, be sure to come by the booth and say "Hi."